There are so many cute crochet appliqués that you can make, and there are so many things that you can do with crochet appliqués, adding them to any project at all to give it a different style or a bit of flair. In order to add crochet appliqués on to your other crochet projects, you need to know how to attach them. You can use either yarn or thread to attach your applique. It is recommended that you use the same type of yarn or thread you used to crochet either the appliqué itself or the item you will attach it to. If you used two or more different yarns, you'll have to make a decision about which one to use for the stitching. There is no "right" answer, just whatever your preference is. In some cases, you may even choose to use a completely different yarn from that used in the project just because you like it better. Sometimes you will attach an appliqué to an item that isn't crocheted. If you're attaching a crocheted applique to a sewn item like a purse, you might want to use sewing thread to attach the appliqué. Play with different materials over time to get a sense of the right options. When using yarn, a large tapestry needle is a good choice for stitching. It is also possible to do some appliqué attachments with a crochet hook, but this guide covers how to sew appliqués on, so a tapestry needle will make the most sense. Place the appliqué where you want to attach it. You may want to use a safety pin or two to hold it in place while you work, although this is not required. Thread your tapestry needle with the yarn or thread you are using for attachment. Pull the thread through the back of the work, towards the front, through the appliqué, leaving a knot of thread at the back of the work (which you can weave in later). Work carefully around the appliqué making neat, even sewing stitches. You will move a little bit over and insert the thread down through the appliqué back to the back of the work, move a little over and bring it back up to the front through the appliqué, etc. You can use the stitches of the appliqué itself or the project you're adhering it to as a guide for making evenly spaced stitches. Which Side Do You Sew From? You can sew your appliqué on from the right or wrong side of the item. It is common to attach it from the right side, especially as a beginner, so you can see what the work looks like as you are stitching. If the item is reversible, it is smart to regularly flip it over and view it to make sure it looks good from both sides. If you're attaching an applique onto a scarf or other reversible item, your stitches will be visible from both sides of the work. You'll have to stitch carefully, and you'll have to decide which color yarn or thread to use when you stitch. One solution is to choose a sewing thread that matches your scarf and to sew tiny stitches through the back of the applique, without bringing your needle all the way through the applique. This way, the stitches are not visible on the applique itself. This will make the item entirely reversible. Another solution is to use the same color yarn as the scarf and to stitch around the applique using a decorative stitch, such as the blanket stitch. This works well with appliques that aren't too detailed, like basic shapes such as leaves or circles. A third option is to attach the appliqué in whichever manner you prefer, using a third color of thread. This would give a contrasting design, making the attachment itself a part of the design. This is rarely recommended in crochet patterns but can be fun to try. Take the time to learn different sewing techniques to enhance your skills. You can use most sewing techniques on crochet. 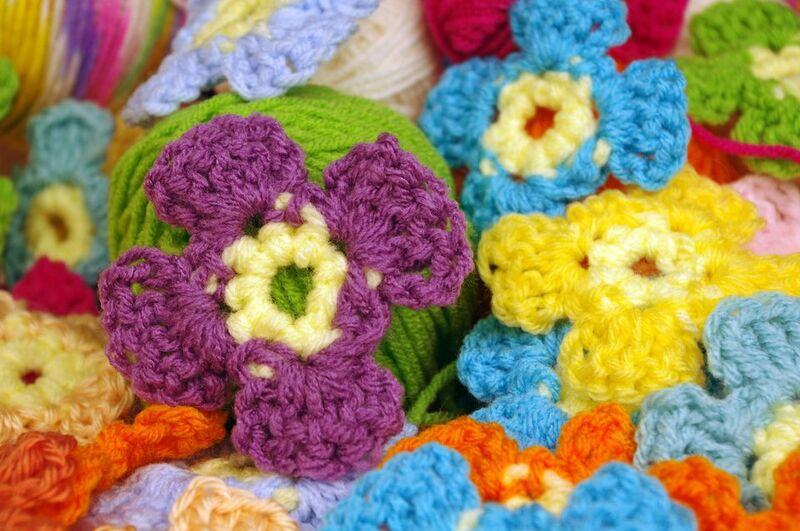 For example, you could whipstitch a crochet appliqué to the front of a crochet blanket. The Perfect Knot has a good example of using topstitching on crochet. You don't have to use sewing to attach your crochet appliqués. You could alternatively use other permanent and semi-permanent methods of attaching your appliqué to your item. Fabric glue, craft glue, and hot glue are examples that would work. Do you want your applique to be removable? Let's say for example you're going to attach a crocheted flower to a crocheted hat. Perhaps you might like to occasionally change your flowers, or perhaps you decorated the flower with something that isn't washable, and you'd like to be able to remove the flower before you wash the hat. If this is the case, you might like to attach your flowers using a method that isn't permanent. Instead of sewing your appliqué on, you can use Velcro, safety pins, or snaps to attach your appliqué. You will need to attach those items to each piece to be able to use the appliqué. For example, you might choose self-adhesive Velcro that just requires you to peel the back and stick it to the appliqué and the hat for attachment.